Arab outlets report IDF arrested 11 suspects during searches in village of Kobar, including 6 relatives of terrorists involved in attacks. Israeli security forces operated in the Ramallah area overnight, continuing the manhunt for the terrorists responsible the planning and execution of the shooting attack at Givat Assaf earlier this month. Two IDF soldiers were killed and two more Israelis wounded in the shooting attack on December 13th, which took place just days after a drive-by shooting attack on a group of Israeli civilians outside of Ofra, just north of Givat Assaf. Early Monday morning, IDF forces, along with the Shin Bet internal security agency and Border Police officers conducted searches in the Binyamin district of Samaria, and arrested a number of suspects. During the searches, Arab rioters attacked IDF forces, hurling stones and firebombs at Israeli soldiers. Israeli security forces used crowd-control methods to disperse the rioters. There were no injuries reported among the Israeli forces. 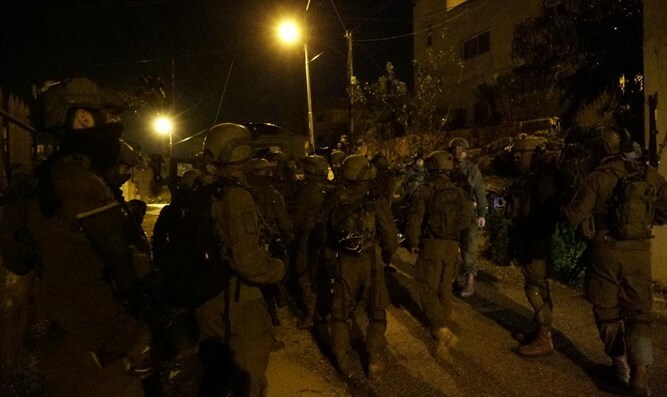 As part of the overnight operations, Israeli forces closed off entrances and exits to the Palestinian Authority-controlled village of Kobar, conducting searches in the village and arresting suspects, including relatives of terrorists involved in the recent spate of attacks.